It's finally here! One of the biggest CS:GO tournaments is set to start in just a couple of days. Of course, I am referring to ELEAGUE Premier 2018, a tournament which had an amazing following last year. This time around, I reckon it won't be much different, especially after looking at the competing teams. Yes, you can say that all the biggest names in the CS:GO professional scene have been invited. This practically guarantees that each and every single match on the tournament will feature a high display of skill, teamwork, and tactics. With 8 teams ready to battle it out and take the biggest share out of the whopping $1,000,000 in prize pool money, the stage is more than set for a proper eSports spectacle! 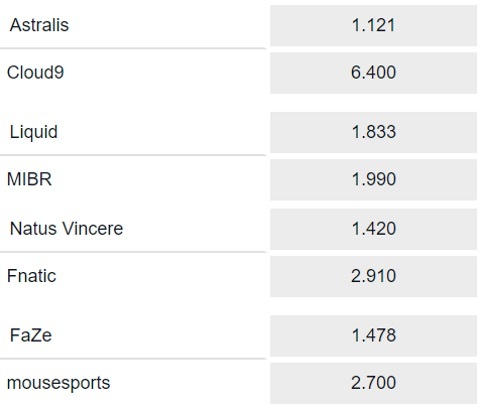 And of couse, you can read all about the CS:GO ELEAGUE Premier 2018 betting odds here. -> View the preview and predictions for Group A – ELEAGUE Premier CS:GO 2018 here. -> View the preview and predictions for Group B – ELEAGUE Premier CS:GO 2018 here. Considering the fact this is one of just a few premier CS:GO tournaments on a yearly basis, it's logical to see a high-quality livestream available. In addition to the official ELEAGUE Twitch channel in English, there will also be Russian language livestream via RuHub.